Not to be a real downer but the World Series so far has me down in the dumps. I didn’t even watch Game 2 because I could have predicted the outcome. To tell you the truth, although I am a true Dodger fan, I am surprised they have gotten this far. I was surprised after all that they won the Western Division. They have been consistently inconsistent all season. That is true even into the World Series games, sad to say. It probably has to do with the constantly changing lineups. It took half a season for them to get used to playing with each other. And then the bullpen seemed to be losing many games until they got it right. Many times the relief pitcher and also the starting pitcher was left in the game until it was just too late. I really do love my Dodgers but watching them take all these blows in the postseason has really been torture. They have been able to pull off the wins when it was important but I think this is the end of the road for them. The Red Sox have been consistently good all season. The Dodgers have been able to see in the last 2 games how difficult it is to beat the best team in baseball. The Dodgers come back to Dodger Stadium on Friday. I’m hoping they can win at least one game. It would be terrible for everyone’s morale if the Dodgers get swept. My thoughts: why not leave the players in when they are hot? Why keep changing the lineup? Why start Ryu on the road when he is better at home? Kershaw has been horrible in the postseason. Considering he hasn’t really been himself all regular season, why put him out there to set him up for more postseason failure. I love Kershaw but why make him the number one pitcher in the World Series? I predict that he will not be a Dodger next season. He’ll be on a Texas team. Why Brian Dozier? He hasn’t been all that great in the regular season. The owners should have gotten Verlander when they had the chance. They should have made the extra effort and gotten the missing pieces for a better bullpen. The odds and ends are not consistently good. The only relief pitchers who seem to be good are Baez (yes, Baez) and Maeda (who is a starting pitcher). I love Alex Wood but he’s not a relief pitcher. You put all these missing pieces together and you do not get a World Series championship team. And then have the Dodgers play the best team in baseball, and you get a dismal outcome. I predicted that the Dodgers would not win a game in Boston. It’s cold and the Dodgers are not good in the cold. Hopefully the heat in LA will help them play a little better so they don’t embarrass themselves. The way the games have gone in Boston, hopefully the Dodgers have not lost their spirit. Keys to winning: let the hot players start the game. Forget this lefty-righty business. The other teams are wise to the sabermetric @#$$% that the Dodgers love to use. It’s obviously not working against a great team like the Red Sox. If the starting pitcher obviously is having issues, take him out before it turns into slaughter. If the pitcher doesn’t have control, he won’t get it miraculously before it’s too late. That’s been obvious. Don’t be switching the players in mid-game for whatever reason. It’s not working. Do not substitute Grandal for Barnes for any reason. So Barnes isn’t hitting but neither is Grandal. The Dodgers can’t afford to get any passed balls. The only reason I look forward to the games at Dodger Stadium is because I’ll be glad to see my Dodgers one last time and also I’ll be able to say good bye to my friends. I’ll miss them until baseball season starts again. I’m proud of my guys for getting this far so if winning the World Series is not in the cards, it’s an accomplishment to even play. We’ll all be there in our Dodger blue with our rally towels and our loudest cheers to support them. It’s been the best season ever for me. I’ve met new friends and continued friendships with the best Dodger fans on the planet. Please stop and say hi to me if you do happen to see me. World Series at Dodger Stadium…a dream come true. Two seasons in a row. One of these days the Dodgers will get that trophy. 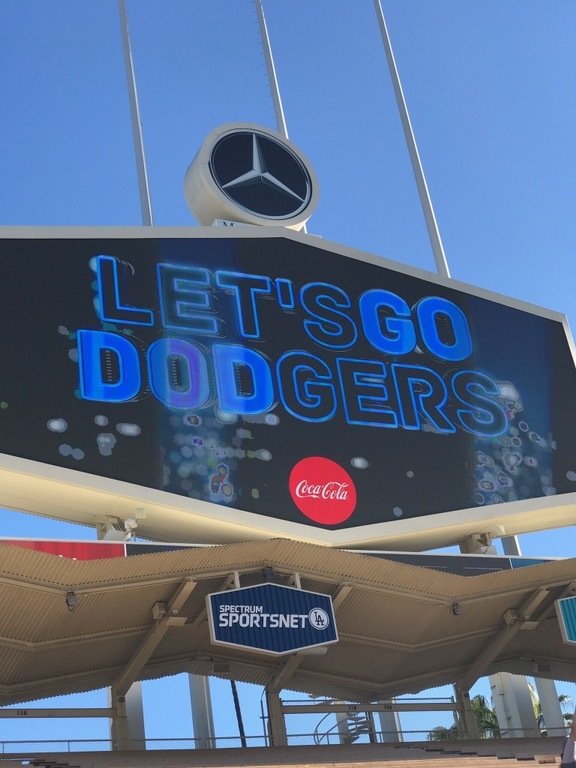 No matter what….I love the Dodgers. Thanks for stopping by. Hopefully I will have a great blog on Saturday morning. See everyone soon. GO DODGERS!! !